EJ attended her last day of preschool yesterday. She has learned so much there and she has amazing teachers! We wanted to give them a little something to let them know how special we think they are...and because there are six of them, it needed to be cost-effective too! 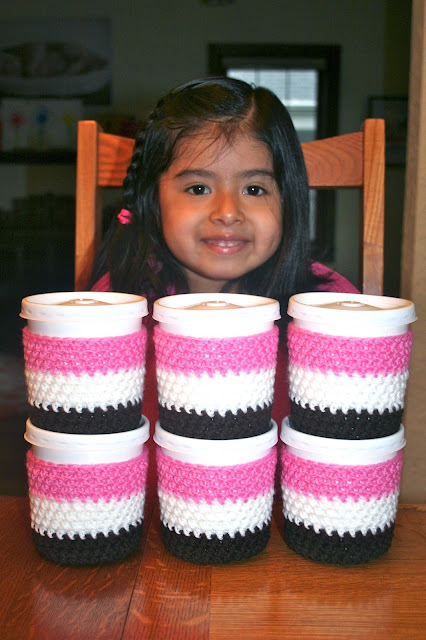 I started with the idea of crocheting ice cream pint cozies. Sure it's a little silly, but it's cute and semi-useful. And it would of course be easy to build a theme around given the Neapolitan color theme and my great love for ice cream. 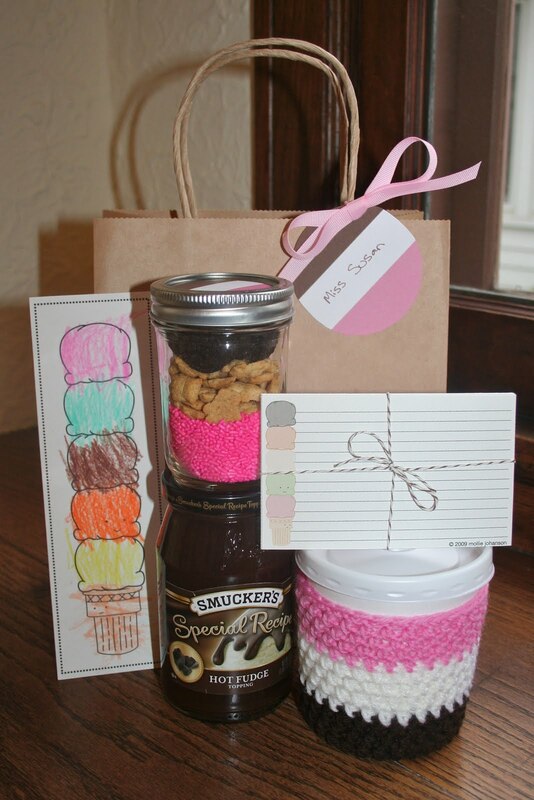 I added some toppings in a mason jar (stacked in the Neapolitan theme), hot fudge, and some awesome free printables (see below for links). The index cards could be used for recipe cards or note cards (I included a set of 6) and the bookmark was hand-colored by Miss EJ with a note on the back ("Love, EJ"). To be honest, I put these together rather quickly so I had to work with what I had based on timing. If I was making these again (and had time to order things), I would add a pack of these straws and a few ice cream spoons. I'd package them up in these gable boxes for an ice cream shop look. And I'd make sure to include this card too. I hate when you come up with an idea too late to add the super cute touches, but I hope her teachers know how much we love them anyway! Not sure when I can steal this idea but, rest assured, I'll find a time. SUPER DUPER CUTE!!! I've been waiting for this! Very very cute! All the ice cream ideas i kept coming up with involved ordering things too so i had to scratch that and move on... but you did well! and I never would've thought to go to Niemann's for the pints!! who knew? What a cute idea! It looks super cute and simple!